Okay, so this is my more nutritious and virtually fat-free version of a home style favorite, chicken and rice (I’m always after comforting, rich-tasting dishes that won’t burst our belts). This has everything you need in one bowl- lean meat, healthy carbs, lots of veggies, and a TON of flavor. And as with traditional homey dishes, it just tastes better and better when served left over. For times when you need to make a healthy, complete meal that can be stretched for days, this is a great bet! 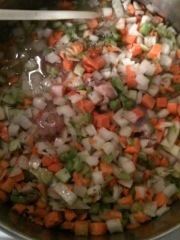 In a large stock pot, combine chicken, veggies, water, chicken base, bay leaves, and thyme over medium heat. I want to point out that while chicken breasts would be slightly more lean, thighs have much more flavor, can be trimmed of fat, and are better at remaining moist in soups and stews like this one. And an added bonus: they’re cheaper! 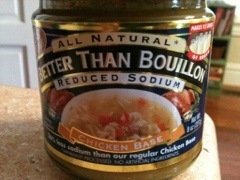 If you haven’t cooked with base before, Better Than Bouillon brand is widely available. You can find it in the soup aisle, and it comes in full salt chicken, beef, and vegetarian options as well. Great to have around for creating deep flavor in all sorts of dishes, fast. Bring pot to a boil, then cover, lower heat, and simmer for 25 minutes. When the chicken is done, remove and set aside to cool a bit. Add 1 1/2 cups of the milk, bring the mixture back to a boil, and cook for 5 minutes. Meanwhile, chop your chicken, mix the flour with the remaining milk, and microwave the bags of rice (4 mins for both). Add the flour/milk mixture to the pot, stirring and cooking until thickened, about 2 minutes. 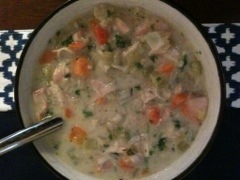 Add the chopped chicken, parsley, rice, and desired amount of black pepper- and give it all a big stir. You’ll have a delicious, comforting bowl of goodness in about 35 minutes! This makes at least 6 generous servings- halve if you don’t want to eat it for a week. You could also substitute whole wheat egg noodles in the second-to-last 5 minute cooking phase in lieu of the rice. Top with Parmesan to make the dish a bit more rich. This entry was posted in Chicken, Classics, Dinner, Easy, Gluten free, Healthy Spin, One Pot, Side Dish and tagged chicken and rice, chicken with rice, gluten free dinner. Bookmark the permalink.